We’ve got something mega in our garage this week, or at least the all-new 2019 Ascent is big for Subaru. 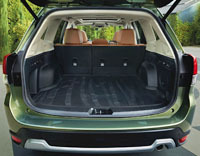 Having arrived here over the summer, the North American-exclusive, three-row, mid-size crossover SUV is configured for eight occupants in standard trim and seven with optional second-row captain’s chairs, the latter setup being how Subaru’s communications team outfitted our tester. In case you weren’t aware, Subaru has been down the mid-size crossover SUV road before, and I’m not talking about the Outback that not only continues to outsell all tall wagon competitors, but is the best-selling of its kind in history. The model I’m referring to was the 2005 to 2014 Tribeca, which was nicely finished and very competent from a performance standpoint, yet suffered from frontal styling that wasn’t accepted by the masses and a third row that was cramped at best, whereas the new Ascent pulls design cues from Subaru’s highly successful current Forester and Outback, albeit with a larger grille and a longer, taller profile, while it’s anything but short on size. The Ascent measures 4,998 millimetres (196.8 inches) front to back with a 2,890-mm (113.8-inch) wheelbase, while it stands 1,819 mm (71.6 inches) tall including its standard roof rails. Additionally, it spans 2,176 mm (85.6 inches) wide with its side mirrors extracted, while its track measures 1,635 mm (64.4 inches) up front and 1,630 mm (64.2 inches) at the rear. To put this into perspective, the new Ascent is 48 mm (1.9 inches) shorter than the mid-size three-row SUV category’s best-selling Ford Explorer, albeit with a 24-mm (0.9-inch) longer wheelbase, while some might also be surprised to find out the new Subaru is 42 mm (1.6 inches) taller than the big blue-oval utility. The only Explorer measurements to exceed the Ascent relate to width, which show Ford’s SUV a considerable 119 mm (4.7 inches) wider with 66 / 71 mm (2.6 / 2.8 inches) more front / rear track respectively. This said the Explorer is one of the mid-size segment’s largest SUVs. Comparing the new Ascent to other top-sellers shows that it’s longer, wider and taller than the Toyota Highlander and Kia Sorento, longer and taller than the Honda Pilot and Hyundai Santa Fe XL, wider and taller than the Nissan Pathfinder, merely wider than the Dodge Durango, and only taller than the Volkswagen Atlas. By the way, that was only a partial list of the Ascent’s three-row mid-size crossover SUV challengers, the full list (from best-selling to least during the first three quarters of 2018) including the Explorer, Sorento, Highlander, Atlas, Pilot, Durango, Pathfinder, Chevrolet Traverse, Santa Fe XL, Dodge Journey, GMC Acadia, Mazda CX-9, and Ford Flex. Of more importance than mere outward size is passenger volume and cargo space, which for the Ascent measure 4,347 litres (153.5 cubic feet) for the former and 2,449 litres (86.5 cu ft) for the latter when both rear rows are laid flat. That cargo number is just for the most basic of Ascent trims, by the way, which also measures 1,345 litres (47.5 cu ft) behind the 60/40-split second row and 504 litres (17.8 cu ft) behind the 60/40-split third row, while all other trims are half a litre less commodious at just 2,435 litres (86.0 cu ft) of gear behind the first row, 1,331 litres (47.0 cu ft) behind the second row, and 498 litres (17.6 cu ft) behind the third row. These figures compare well against key rivals, with Ascent passenger volume even exceeding the Explorer’s and its standard eight-occupant seating configuration a rarity in the class, while the big Subaru’s maximum cargo capacity is amongst the segment’s most accommodating too. 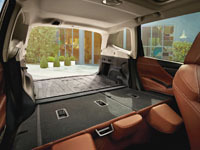 Also important, rear passenger access is made easier due to rear doors that open to 75 degrees. 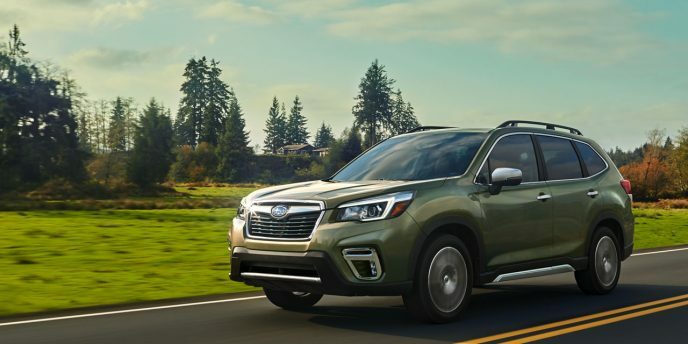 Being a Subaru SUV the Ascent includes standard full-time Symmetrical AWD, which has proven to be one of the more capable available. Its initial advantage starts with more evenly balanced weight distribution thanks to a longitudinally-mounted engine and transmission, its competitors chassis architectures derived from FWD models housing transversely-mounted motors, while Subaru’s horizontally-opposed flat “boxer” engine allows for a lower centre of gravity. Furthermore, Symmetrical AWD applies more torque to the wheels with the most grip, which is not only designed to enhance traction when taking off but to improve overall control at speed, so in theory the Ascent should be plenty capable no matter the road or trail surface it’s traveling over, while its standard X-mode off-road system, complete with hill descent control, and its generous 220 millimetres (8.66 inches) of ground clearance for overcoming obstacles, snow banks, etcetera, should make easy work of the rough stuff. We’ll let you know just how capable the Ascent is in our upcoming road test review, and of course give you a full report on its on-pavement driving dynamics too. Power comes from a new turbocharged 2.4-litre four-cylinder engine, which as noted is once again a horizontally opposed design. It makes a healthy 260 horsepower and 277 lb-ft of torque, the latter maximized between 2,000 and 4,800 rpm. Subaru will likely use this engine as a replacement for its aging 3.6-litre H-6 in top-line Outback trims too, being that the new four-cylinder produces 4 more horsepower and 30 additional lb-ft of torque than the six. Of course, at 11.6 L/100km city and 9.0 highway for the new 2.4-litre four when used for in the Ascent, compared to 12.0 and 8.7 respectively for the larger displacement H-6 in the Outback, the smaller engine would be much more efficient in the Outback as well. Of note, both four and six cylinder engines use variations of Subaru’s High-torque Lineartronic CVT (Continuously Variable Transmission), considered to be one of the more efficient types of transmissions available and ideal for mid-size crossover SUV applications thanks to smooth, linear power delivery. With the Ascent, Subaru adds a standard set of steering wheel paddle shifters to improve driver engagement, along with an eight-speed manual mode featuring sportier driving characteristics and standard Active Torque Vectoring, first introduced on the WRX and WRX STI performance models, so expect us to report something positive about its driving dynamics when we deliver our full review. Likewise, expect some insight on the Japanese brand’s car-like ride and handling claim that comes from the Ascent’s use of the new Subaru Global Platform (SGP), which combines rigid yet lightweight unibody construction with a fully independent MacPherson strut front and double-wishbone rear suspension system, enhanced further by a stabilizer bar mounted directly to the body at the rear and electric rack and pinion steering up front. This all rolls on 18-inch silver five-spoke alloys on 245/60 all-seasons with the Ascent’s two lower trims and 20-inch machine-finished high-gloss split-spoke rims on 245/50 rubber for the two upper trims, my tester benefiting from the latter. 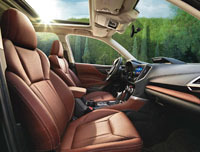 On that note, the 2019 Ascent can be had in Convenience, Touring, Limited and Premier trims, with standard Convenience features not already mentioned including auto on/off halogen headlights, LED daytime running lights, roof rails, a 4.2-inch colour TFT multi-information display, three-zone automatic climate control, 6.5-inch touchscreen infotainment with Android Auto and Apple CarPlay smartphone connectivity, a rearview camera, six-speaker audio, satellite radio, three-way heated front seats, an eight-way power-adjustable driver’s seat, second-row USB ports, a total of 19 cup and bottle holders, and more for just $35,995 plus freight and fees. All 2019 Ascent trims also include standard Subaru EyeSight driver assist technologies that include adaptive cruise control with lead vehicle start assist, pre-collision braking, pre-collision brake assist, pre-collision throttle management, lane departure warning, lane sway warning, and lane keeping assist, while all the expected active and passive safety features come standard as well. For $40,995 in eight-passenger trim or $41,495 with second-row captain’s chairs, which reduces the total seat count to seven, Ascent Touring trim adds the Subaru Rear/Side Vehicle Detection (SRVD) system that includes blind spot detection, lane change assist, rear cross-traffic alert and reverse automatic braking, as well as unique machine-finished five-spoke 18-inch alloys, body-colour side mirrors with integrated LED turn signals and approach lighting, LED fog lamps, a sportier rear bumper cap with integrated tailpipe cutouts, proximity keyless access, pushbutton ignition, front door courtesy lights, chrome inner door handles, a Homelink garage door opener, a windshield wiper de-icer, auto-dimming rearview and side mirrors, a leather-wrapped steering wheel and shift knob, larger 8.0-inch touchscreen infotainment, premium cloth upholstery, a powered panoramic sunroof, magazine pockets on the front seatbacks, second-row climate controls, third-row reading lights, a rear cargo cover, a powered liftgate, a transmission oil cooler, trailer stability control, and pre-wiring for a trailer hitch that increases towing capacity to 2,270 kg (5,000 lbs). Limited trim, available for $46,495 in the eight-passenger layout and $46,995 in the seven-passenger configuration, adds the larger 20-inch alloys mentioned earlier, plus steering-responsive full low/high beam LED headlights with automatic high beam assist, black and ivory soft-touch interior surfaces, a heatable steering wheel, an upgraded gauge cluster with chrome bezels and light blue needles (in place of red), and a 6.3-inch colour multifunction display atop the dash that shows the time, temperature and dynamic features such as an inclinometer, while a navigation system with detailed mapping is included within the infotainment display, as is SiriusXM Traffic, whereas additional Limited features include a 14-speaker 792-watt Harman/Kardon audio system, a 10-way power-adjustable driver seat upgraded to include powered lumbar support and cushion length adjustment, driver’s seat and side-mirror memory, a four-way power-adjustable front passenger seat, leather upholstery, two-way heatable second-row outboard seats, integrated rear door sunshades, third-row USB ports, and more. Top-line Premier trim, which comes fully equipped at $49,995, even including standard captain’s chairs, adds an upgraded high-gloss black grille insert, satin-finish side mirror caps, chrome exterior door handles, rain-sensing wipers, ambient interior lighting, a front-view camera, a Smart Rearview Mirror with an integrated rear-view camera, woodgrain inlays, brown perforated leather upholstery, ventilated front seats, a 120-volt power outlet on the rear centre console, and more. 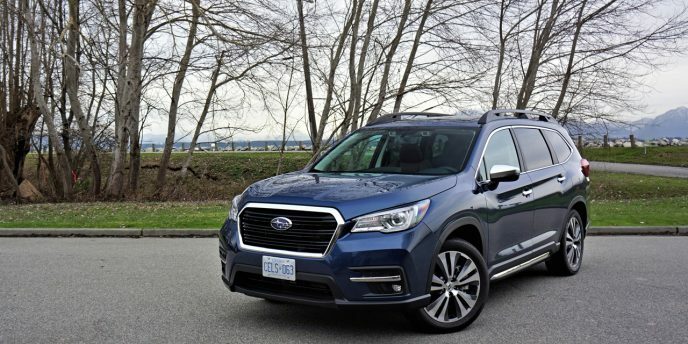 All 2019 Subaru Ascent pricing was sourced from CarCostCanada, where you can also find detailed pricing on trims, packages and standalone options for every other new model sold in Canada, plus otherwise hard to get rebate information and dealer invoice pricing that could save you thousands. Full disclosure: orange is one of my favourite colours. I painted my bathroom and even my bedroom in a beautiful, rich, bold orange hue. I own multiple orange T-shirts, sweaters, and an orange down puffy jacket. I love carrots, pumpkins, persimmons and mangos, and enjoy mandarins, tangerines and other types of oranges even if their highly acidic nature tends to disagree with me. Nevertheless, this 2019 Forester Sport takes orange a bit too far. The thick orange striping along the otherwise matte black lower exterior panels doesn’t cause me issue, but the orange painted shifter surround and dash vents are a constant assault on the senses, although I like the orange contrasting thread just fine. In my books the overzealous use of orange slots into the “too much of a good thing” category, and is similar to my criticisms of all the red gone wrong with the latest Honda Civic Type R.
I’ve got the new fifth-generation 2019 Subaru Forester in the garage this week, and while Sport trim wouldn’t be my first choice due to orange overload, it’s a major improvement over the crossover SUV it replaces in most every other way. 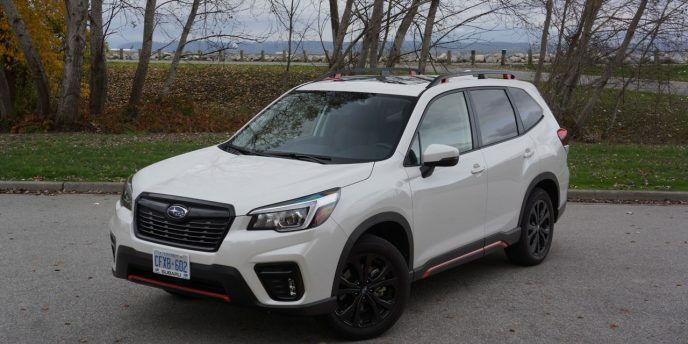 Starting at $27,995 for 2019, which is $2,000 more than last year’s base Forester, this latest model comes standard with a set of stylishly safer LED headlamps, an advanced technology that previously required a move up to Limited trim in order to partake, and one that’s still optional with most of its rivals including the totally redesigned 2019 RAV4 and recently redesigned Honda CR-V—the Mazda CX-5 already comes standard with LED headlights and refreshed 2019 Jeep Cherokee now does as well. The new LED headlamps get automatic on/off too, so you won’t always have to remember to turn them on and off manually, this standard feature part of last year’s Convenience upgrade, while new standard automatic climate control gets pulled up from 2018’s Touring trim. I like the new electromechanical parking brake that replaces the old handbrake, freeing up space between the front seats and modernizing the driving experience, while auto vehicle hold now replaces the old hill holder system that previously only came with the manual transmission, which is now discontinued. In its place, Subaru’s Lineartronic continuously variable automatic transmission (CVT) is now standard across the line, which means that Subaru’s impressive X-Mode off-road system with Hill Descent Control, and SI-Drive drive mode selector are now standard too. Together with the CVT and Subaru’s much praised Symmetrical full-time all-wheel drive system that remains standard, all 2019 Foresters get a new direct-injection enhanced 2.5-litre four-cylinder boxer engine that’s good for 182 horsepower and 176 lb-ft of torque, which is 12-horsepower and 2-lb-ft more than last year’s identically sized base engine. The upgraded drivetrain now includes an auto start/stop system that automatically shuts off the engine when it would otherwise be idling, which helps to reduce emissions while improving fuel economy, but it isn’t without fault (more on this in my upcoming review). Just the same the new Forester manages a 0.2 L/100km savings in combined city/highway driving despite the increase in performance, from 9.2 L/100km city, 7.4 highway and 8.4 combined to 9.0, 7.2 and 8.2 respectively. My big disappointment for 2019 isn’t with this very strong base powertrain, but rather is due to the discontinuation of Subaru’s wonderful 2.0-litre turbocharged engine upgrade that previously put out 250 horsepower and 258 lb-ft of torque and still managed a relatively thrifty 10.2 L/100km city, 8.6 highway and 9.5 combined. True, few vehicles in this class offer such a formidable optional engine, but it was nevertheless an important differentiator in a market segment that’s highly competitive. As far as 2019 trims go, the base model is once again simply called 2.5i in reference to its engine displacement, and along with everything already mentioned includes standard power-adjustable heated side mirrors, variable intermittent wipers, steering wheel controls, cruise control, filtered air conditioning, a backup camera with dynamic guidelines, Bluetooth with audio streaming, StarLink smartphone integration with Aha radio, HD and satellite radio, two USB ports/iPod interfaces, an aux input, heatable front seats, roof rails, the usual active and passive safety features including an airbag for the driver’s knees, etcetera. The standard infotainment touchscreen is now 0.3 inches larger in diameter at 6.5 inches, and also features standard Apple CarPlay and Android Auto smartphone connectivity that wasn’t even optional before. Standard features get even more generous in second-rung Convenience trim, which for $30,295 includes everything from the base model plus fog lamps, a rear rooftop spoiler, 17-inch alloys replacing the standard 17-inch steel wheels with covers, a windshield wiper de-icer, silver finish interior trim, chrome interior door handles, a leather-wrapped steering wheel, paddle shifters, a colour TFT multi-information display within the gauge cluster, a 6.3-inch colour multi-function display atop the dash that’s controllable via steering wheel-mounted switchgear, two more stereo speakers for a total of six, dual-zone automatic climate control (the base model is single-zone), sunvisor extensions, illuminated vanity mirrors, premium cloth upholstery, a 10-way powered driver’s seat with lumbar support, a flip-down rear centre armrest with integrated cupholders, and more. Above this, the Sport model being tested this week, plus Limited and Premier trims get a new two-mode X-Mode off-road system that’s capable of even greater go-anywhere prowess thanks to separate settings for snow and dirt, as well as deep snow and mud, while larger 316 mm front rotors add better braking power over the standard 294 mm discs. Additionally, the top three trims include steering responsive headlights and Subaru’s Side/Rear Vehicle Detection (SRVD) system as standard equipment, improving safety, plus a leather shift knob and a new 8.0-inch touchscreen adds an inch to the diameter of last year’s top-line infotainment interface, while once again including Apple CarPlay and Android Auto where there wasn’t such advanced smartphone connectivity last year. These upper trims also include dual rear USB ports for a new total of four, plus A/C ducts on the backside of the centre console, and reclining rear seats. As mentioned, the new $34,995 Sport that I’m tested is the visual standout of the 2019 Forester lineup, whether that’s a good a positive or negative in your view. Along with all the orange it gets a unique gloss black grille, special front corner grilles, a larger rear spoiler, a blackened out trim strip that runs across the rear liftgate before striking through the taillights, and a unique rear under-guard. The Sport also features exclusive dark metallic 18-inch alloys, while LED daytime running lights, vertically stacked LED fog lamps and LED turn signals integrated within the mirror caps add to its upmarket appeal. An exclusive Sport feature includes an SI-Drive Sport system that provides more immediate throttle response, which I’ll report on in my future review. Lastly, the Forester Sport replaces the availability of Crimson Red Pearl, Horizon Blue Pearl, Jasper Green Metallic, and Sepia Bronze Metallic exterior colours with an exclusive Dark Blue Pearl paint finish, which wasn’t included with my Crystal White Pearl painted test model. I should probably talk about $37,695 Limited trim in this garage story too, being that I’ve already covered the others. This might be my Forester of choice if the extra $2,700 weren’t an issue, mainly because it loses the Sport’s over-the-top orange-ness, and while I would prefer to keep the latter model’s performance upgrades that are also nixed when choosing Limited trim, they’re not as important in an SUV like this as they’d be in a WRX, per se. The Limited keeps most of the Sport’s convenience and luxury upgrades mind you, while adding unique 18-inch 10-spoke bright-finish machined alloy wheels, a premium grille, chrome detailing around the fog lamp bezels and side windows, auto-dimming side mirrors with approach lighting and reverse tilt (the latter item a Subaru first), an auto-dimming rearview mirror with an integrated compass, chrome trimmed primary gauges, a heatable steering wheel rim, GPS navigation, SiriusXM Traffic and Travel Link with weather, sports and stock market information, an eight-speaker, 440-watt Harman Kardon audio system with an eight-channel amplifier, leather upholstery in black or platinum, silver contrast stitching throughout, driver’s seat memory, heatable rear outboard seats, and one-touch folding rear seatbacks. Maybe I should’ve waited to choose a favourite, because for just $1,800 more than the Limited you can opt for near luxury SUV-level $39,495 Premier trim, which is now top-of-the-line for 2019. It once again includes the vertical LED fog lamps from the Sport within unique satin-silver trimmed bezels, as well as special aluminum-look satin-silver trim on the front fascia, side mirror caps, roof rail posts, side sills, and rear bumper. Additionally, exclusive 18-inch five-spoke machined alloy wheels combine with chromed exterior door handles and a stainless steel rear bumper step pad to spiff up the look further. 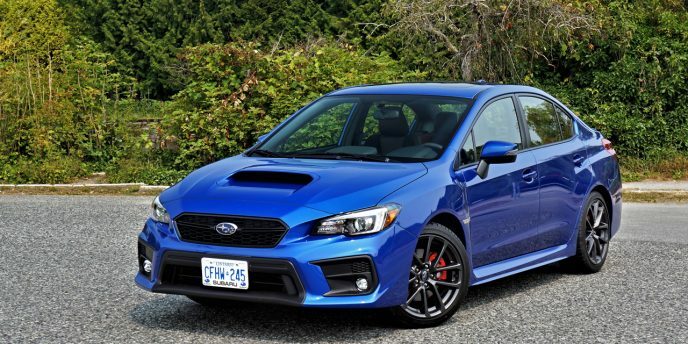 I should also mention that all of the trim details and prices were verified at CarCostCanada, where you can also find dealer invoice pricing that could save you thousands when negotiating with your Subaru dealer, plus they have rebate information on any discounts that might be available to you. 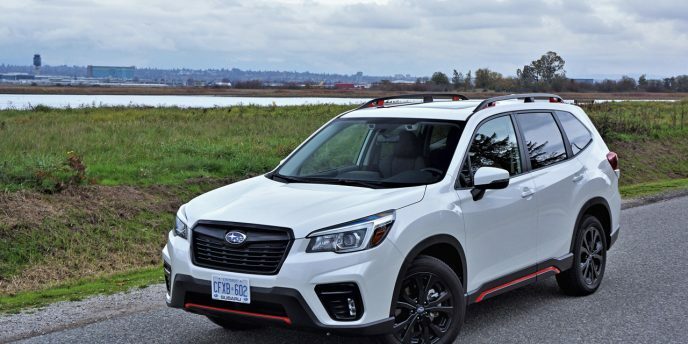 Continuing on, the 2019 Forester has been thoroughly redesigned around the new Subaru Global Platform (SGP), which has resulted in greater refinement, capability and dynamic performance, plus more interior roominess. It’s difficult to grow inside without growing outside, with the new Forester now measuring 15 millimetres (0.6 inches) more from front to back at 4,625 mm (182.1 inches), with a 30-mm (1.2-inch) longer wheelbase at 2,670 mm (105.1 inches), while it’s also 21 mm (0.8 inches) wider including its mirrors at 2,052 mm (80.8 inches), or 20 mm (0.8 inches) wider not including its mirrors at 1,815 mm (71.4 inches). Its front and rear track has widened too, now up 20 and 15 mm (0.8 and 0.6 inches) respectively to 1,565 and 1,570 mm (61.6 and 61.8 inches), which, along with the Forester’s other dimensional and mechanical changes has caused a one-metre (3.3-foot) larger curb to curb turning circle of 5.4 metres (17.7 feet). Despite maintaining its minimum ground clearance at 220 mm (8.6 inches), the new Forester is actually 5 mm (0.2 inches) lower in height than its predecessor with its roof rails included at 1,730 mm (68.1 inches), while its base curb weight has increased by a 26 kilograms (57.3 lbs) at 1,569 kilos (3,459 lbs) when compared to the previous model’s optional CVT. Still, the fully loaded 2019 Forester Premier now weighs in at 1,630 kg (3,593 lbs), which actually makes this top-line model a surprising 56 kg (123.4 lbs) lighter than the ritziest version of the 2018 model in spite of its greater size. Along with a more spacious passenger compartment, the new Forester improves cargo capacity by 29 litres (1.0 cubic-foot) behind the 60/40 split-folding rear seatbacks in base trim, from 974 to 1,003 litres (34.4 to 35.4 cubic feet), and by 40 litres (1.4 cubic feet) in base trim when those seats are laid flat, from 2,115 to 2,155 litres (74.7 to 76.1 cubic feet). When the optional sunroof is added, which encroaches slightly on overhead space, the difference from old to new grows to 43 litres (1.5 cubic feet) behind the rear seatbacks, from 892 to 935 litres (31.5 to 33.0 cubic feet), and 68 litres (2.4 cubic feet) when the rear seats are lowered, from 1,940 to 2,008 litres (68.5 to 70.9 cubic feet). This is a significant improvement that can really make a difference when faced with a large load of gear.